This quarter we are going to take a look at the kidney. This organ has always been my favourite. It’s part of the really clever urinary system, and I find it fascinating. Our kidneys are located on each side of our spine, just below half way up our back, and although we have two, we can quite healthily survive with just one. Not only that, we are still able to survive unaided if that single kidney only had 50% of its function. Also, unlike the pretty much instantaneous death caused by removing a brain or heart, if we were to have both kidneys removed, it wouldn’t take minutes or even hours until we died, it would take days……Days!! control electrolyte composition and the amount of body fluids. filter oxygenated blood (supplied by the renal arteries) and extract any waste products from it (and expel them into the urine). Structures of the kidney. Inset: a closer look at the black dotty outlined region: the nephron (click to embiggen). Images are adapted from wikicommons: Main & Inset. 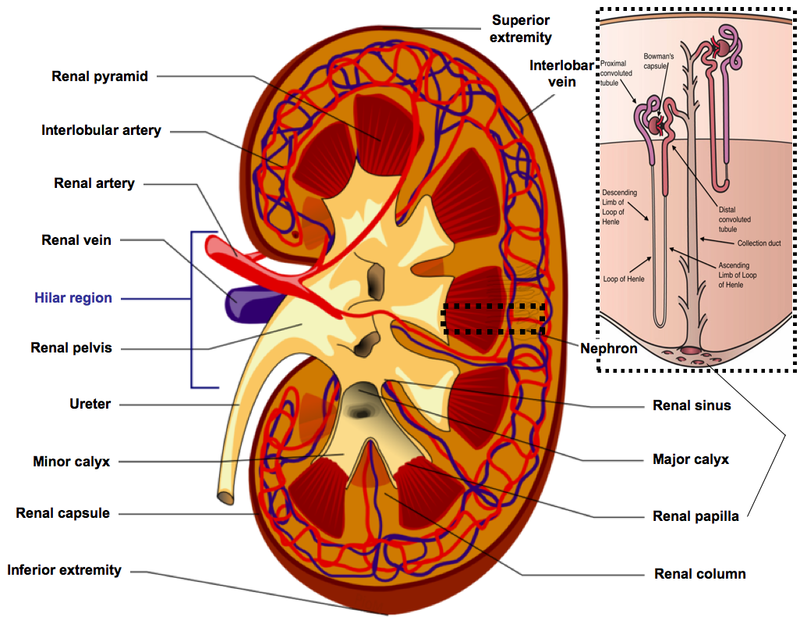 The outermost region of the kidney is called the renal capsule, which is made up of dense fibrous tissue. 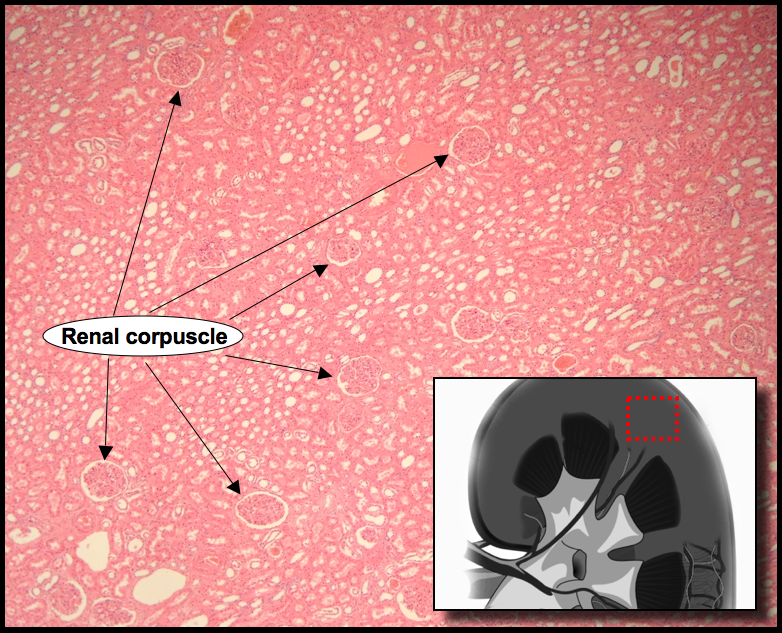 A medium power H&E of the renal capsule and its relation to the cortex. Inset: the red outline shows the site that corresponds to the H&E. Directly beneath the capsule is the outer cortex. 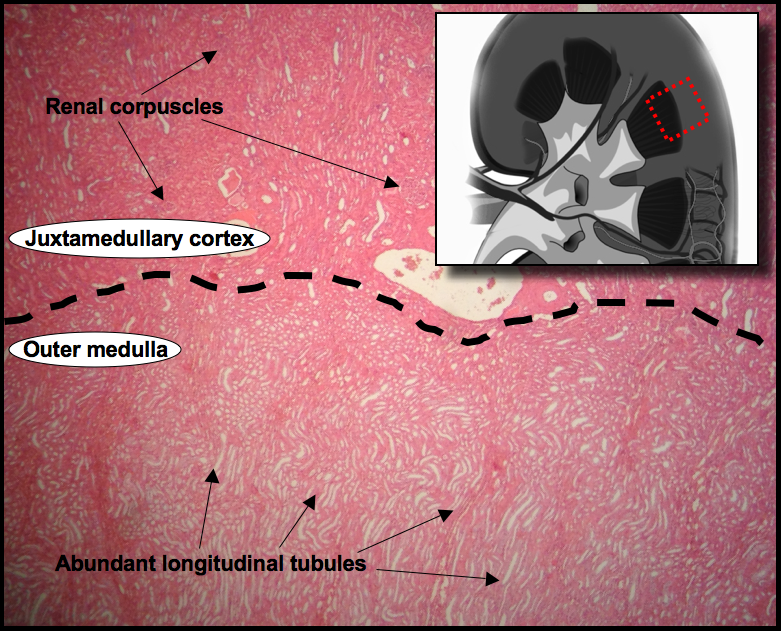 Moving in towards the centre of the kidney, the next region is the juxtamedullary cortex. Much deeper, is the medulla with its inner and outer medullary regions, too. The identification of the cortex and medulla is easily made both macro- and microscopically. Macroscopically, the two vary in colour from each other, and the medulla is made up of distinctive “pyramids”; a name owing to their (rough) shape. What is also very distinctive macroscopically are the regions that the urine drains into from the medulla, which are called the minor and major calyces (see first image). The calyces converge to become the renal pelvis, which carries the urine to the ureter and out of the kidneys towards the urinary bladder. Microscopically, the cortex is identified as the region that contains renal corpuscles, and the medulla is the region that contains more prominent longitudinal tubules. 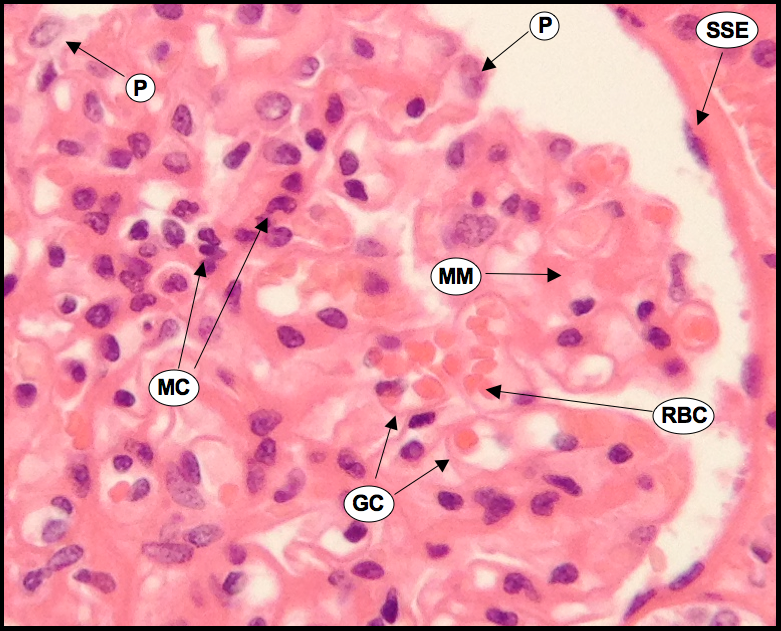 Renal corpuscles (also known as the Malpighian corpuscles) measure approximately 300µm (0.3mm) in diameter. These structures look like scraggy balls of string captured inside irregular bubbles, but what they really are are intricate micro-filtering machines that consist of a Bowman’s capsule and a glomerulus. These renal corpuscles, together with the tubules that run in continuation from them, are collectively known as a nephron (see first image). The glomerulus is a bundle of capillaries, and it’s this network that gives the glomerulus its scraggy ball-of-string appearance. 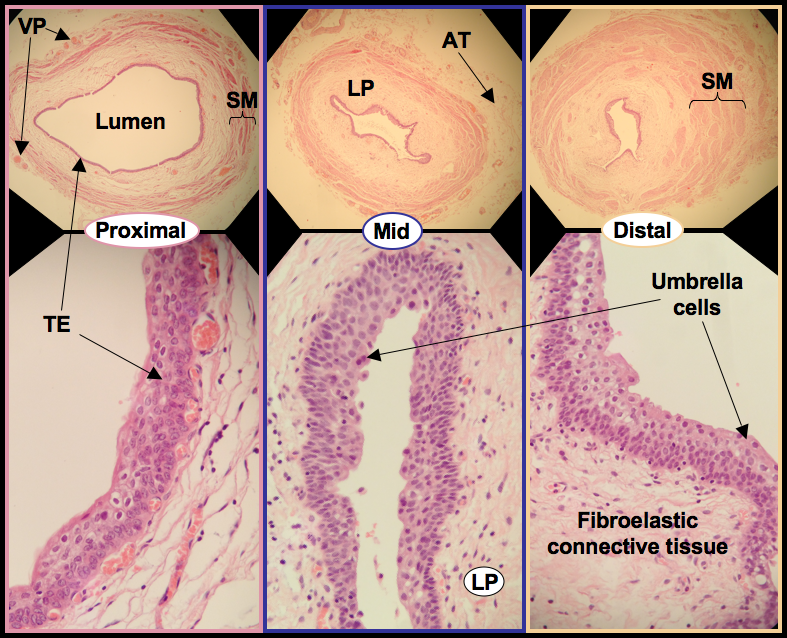 The lumen of the glomerular capillaries are lined by endothelial cells that contain a number of very tiny holes, or fenestrations (not visible on a H&E, unfortunately). These are what make the capillaries permeable to water, sodium, urea, glucose and small proteins. The filtering of our blood begins here. A high power H&E of a renal corpuscle. 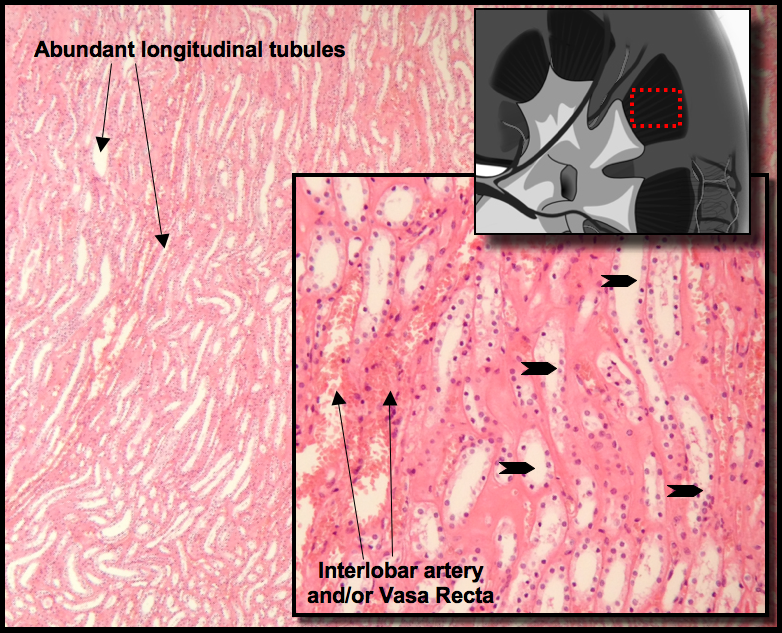 Key: PCT = proximal convoluted tubule, DCT = distal convoluted tubule. Blood flows into the glomerulus via the afferent arteriole, and once it has been filtered, exits the glomerulus via the efferent arteriole. (Little revision tip: “A” for afferent=arrive, “E” for efferent=exit). 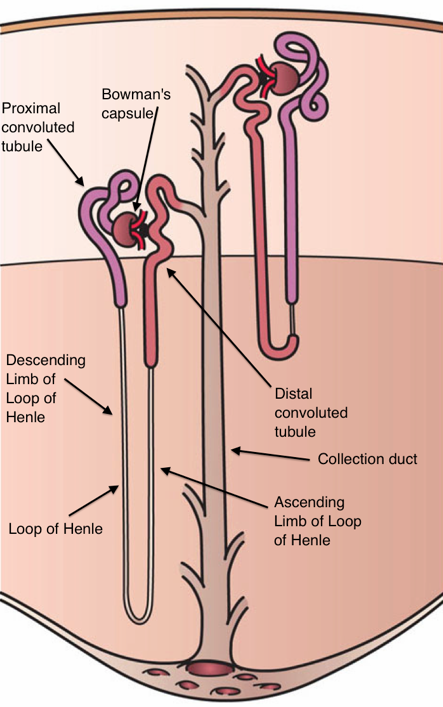 You’ll notice that the glomerulus appears tied down at one side, well, this is called the vascular pole, and it’s where the afferent and efferent arterioles enter and exit the renal corpuscle. 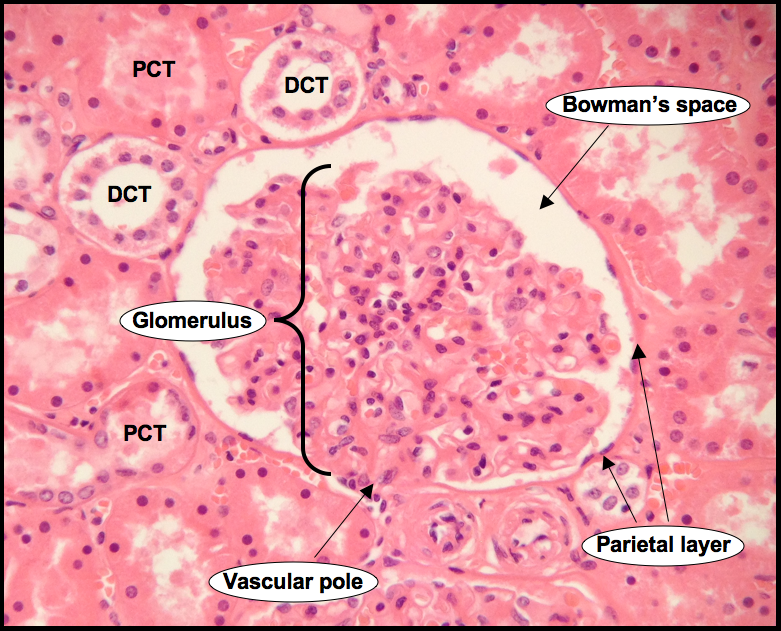 The what seems to appear like a “free” end of the glomerulus is called the Bowman’s space, and this is where the filtrate (known as the primary urine or ultrafiltrate) that has been extracted from the blood is then collected. The Bowman’s space is defined as the region between the two layers of cells that make up the Bowman’s capsule. The cell layer that covers the outlining wall of the bubble-looking part of the Bowman’s capsule is called the parietal layer. It is made up of squamous epithelium, and is continuous with the simple cuboidal epithelium that lines the lumen of the following structure downstream, which is the proximal convoluted tubule (PCT). The region in which the Bowman’s space joins with the PCT is called the urinary pole. Coating the outer surface of the glomerulus is the visceral layer. This consists of spider-like cells with long “arms” and “legs” that grasp around the glomerular capillary. These cells are called podocytes, and together with the fenestrated endothelial cells mentioned earlier, they constitute the glomerular filtration barrier (filtration slits) that the ultrafiltrate passes through. Also within the visceral layer is the mesangium. This consists of mesangial cells and mesangial matrix. Now, mesangial cells are pretty awesome because they have characteristics of both smooth muscle cells and macrophages. They contract to regulate the blood flow from and to the afferent and efferent arterioles, respectively, and they do this in response to endothelins and angiotensin II (proteins involved in altering blood pressure). The phagocytic role of the mesangial cells is particularly useful when larger proteins, e.g. immunoglobulins and complement, which cannot cross the filtration barrier, become trapped in the basal lamina (an extracellular matrix that provides support and stability for cells). The mesangial cells can digest these proteins, thus unblocking the filters. The mesangial matrix is actually synthesised by the mesangial cells, and this contains varying amounts of fibronectin, type IV collagen, perlecan and laminin, but I will not be going into any more detail about these in this blogpost. This is regarded as the “reabsorption component” because it is where a whopping 70% of the water, glucose, Na+, Cl–, K+ and other solutes that were filtered by the glomerulus become reabsorbed back into the body. As mentioned earlier, this tubule is lined by cuboidal epithelium. These cells also have microscopic hair-like structures (collectively called a “brush border”) that encourage the flow of ultrafiltrate through the PCT and along to the next structure downstream, which is the Loop of Henle. The PCT often contains a pink hue in the lumen, which makes it distinguishable from the DCT because the lumen of the DCT is clear (see earlier image). This structure is the U-bend of the nephron. The descending and ascending limbs of the LoH have thick and thin regions. Both thick regions are lined by low cuboidal epithelium, and the thin regions are lined by simple squamous epithelium. The descending limb reabsorbs approximately 15% of the filtrate, and this reabsorption is driven by the osmotic gradient that is created between these tubes and the surrounding fluid in the tissues. The ascending limb is completely impermeable to water but is permeable to NaCl and urea, and so this is the major site where separation of water and solutes occur. The normal function of the LoH is crucial to the excretion of both dilute and concentrated urine. The DCT follows on after the LoH. It is lined by cuboidal epithelium but does not have a brush border, and is much shorter than the PCT. The permeability of this region to water is orchestrated by antidiuretic hormone (ADH). In the presence of ADH, the DCT is permeable to water and allows for the surrounding tissue to reabsorb it. Alternatively, in the absence of ADH, the tubule becomes impermeable to water, which prevents water from being reabsorbed and allows the fluid to enter the collecting tubules and into the collecting ducts. Here, concentrated urine is made. 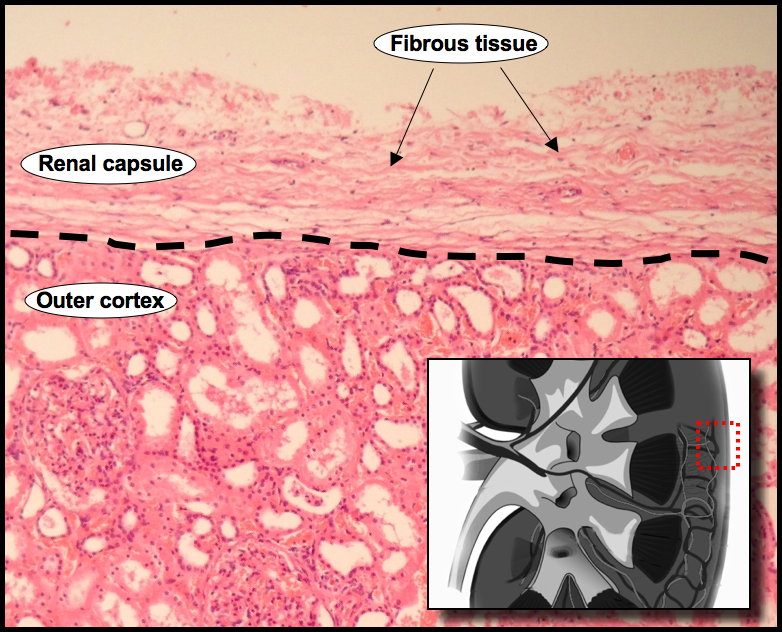 Each collecting duct is lined by two types of cuboidal epithelium. The “principal” epithelial cells reabsorb Na+ and water, and secrete potassium. The “intercalated” epithelial cells secrete either H+ or HCO–3 , and reabsorb K+. 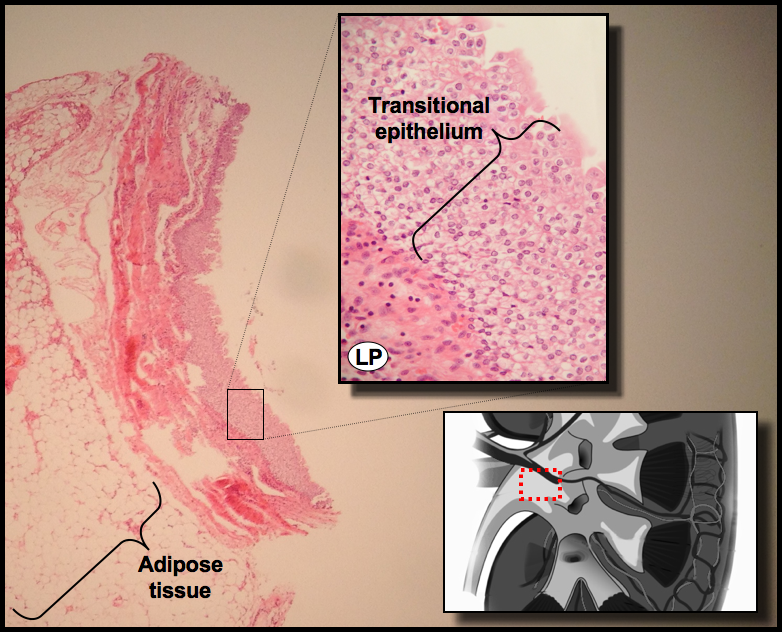 It’s practically impossible to tell the difference between the two types of epithelium on a H&E. Referring back to the very first image, you will notice that the collecting ducts terminate at papilla, which then decant into regions known as minor calyces. The minor calyces themselves converge into a larger major calyx. Major calyces converge to form the renal pelvis. The renal pelvis is lined by transitional epithelium, which is also known as urothelium. The renal pelvis narrows as it passes through the hilar region. 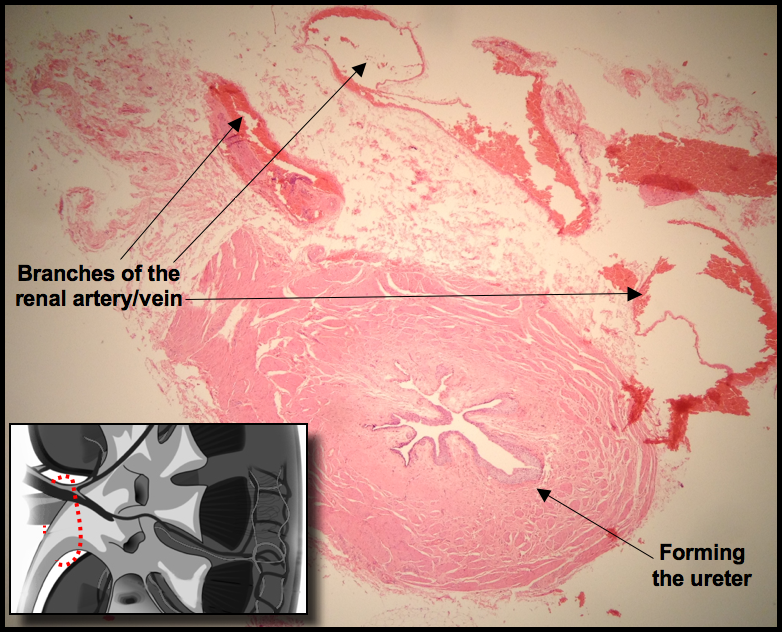 What emerges then are just the renal artery, renal vein and the ureter. The ureter is a simple tubular structure lined by transitional epithelium (urothelium) surrounded by 2-3 layers of smooth muscle that contract in peristaltic fashion to transport the urine on its last highway before entering the urinary bladder. The proximal ureter has the widest lumen, which gradually becomes narrower with proximity to the bladder. A composite image showing H&Es of the proximal, mid and distal ureter. Umbrella cells act as surface protectors. VP = vascular plexus. SM = smooth muscle. TE = transitional epithelium. LP = lamina propria. AT = adipose tissue. And that’s it, the bladder comes next. So, with all these images and descriptions, urine with a good chance of nailing the histology of the kidney. BOOM BOOM. The National Kidney Federation is the largest kidney patient charity in the UK. Run by kidney patients, for kidney patients. Thanks so much for your comment, Karen. I’m so pleased you find my blogposts useful, so thanks for letting me know about that.